Who wants to spend Valentine’s Day with eczema? Nobody. It loves to show up unannounced and ruin your evening. It hates flowers and perfume. It complains about the cold weather, but indoor heating only makes it angrier. No one wants to go out in public with eczema. It’s unattractive, and it makes you do embarrassing things like scratch like crazy during dinner in a fancy restaurant. Alcohol only makes it more painful! Plus, it wants to keep you up all night, and not in a good way (it might even give you an infection). Eczema’s red, then you feel Blue. 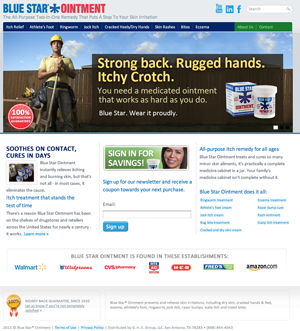 Apply Blue Star Ointment to make your skin new! Hmmm. To be honest, Blue Star Ointment isn’t very romantic, but it’s your best friend when you’re fighting an eczema flare-up. Strong, safe, and reliable, our moisturizing anti-itch formula keeps your skin smooth and beautiful, so you’ll look and feel your best this Valentine’s Day. Happily single or looking to mingle, Apply Blue Star Ointment and feel your skin tingle. …OK, so poetry isn’t our strong suit. We’ll stick to protecting you from eczema. XOXO.